In act 3, “Scena, Terzetto e Tempesta,” from Rigoletto (1851), Giuseppe Verdi (1813–1901) uses offstage male chorus a bocca chiusa to depict not only the sound of the wind amid a storm, but also the “storm” of emotions running through each of the characters involved in the drama: Rigoletto, who has ordered the Duke’s murder for seducing his daughter, Gilda, who despite the Duke’s deception, still loves him; and Maddalena, another woman the Duke unsuccessfully tried to seduce, but who still cares enough to help him avoid his impending assassination by her brother Sparafucile. The high point of the dramatic action, Gilda’s entrance into Sparafucile’s house, coincides with the unleashing of the storm’s full fury. In addition, no storm preceding Rigoletto utilized human voices to convey its composer’s programmatic intent and, as such, pale in comparison with the depth and novelty found here. Not only does this amusing anecdote exhibit the difficulties of explaining such an unfamiliar device, it also confirms that Verdi intended the chorus specifically to symbolize the wind, even though at no point did he actually state this explicitly. The dramatic subject of act 3 is the fulfillment of Monterone’s curse. The Db–D–Db relation set up during the curse scene in act 1 becomes the tonal structure of this final act.3 The two Db downbeats preceding and following the curse itself have now been composed out into a framework consisting of two similar set pieces, the “Quartetto” and the “Duetto Finale,” both in Db. The D-major chord, such a striking detail at the moment of Monterone’s curse, has evolved into the “Scena, Terzetto e Tempesta” in D major-minor. As in the earlier passage, the move to D is accomplished by means of a sudden half-step shift—here from the end of the Quartet to the beginning of the storm scene—while the return to Db involves a carefully prepared harmonic approach. The two Db areas are further related to each other through the use of a recurring theme, “La donna è mobile” in B major, which appears at the beginning of each of the larger sections, in addition to appearing before the trio itself. Verdi creates a subdued atmosphere at the opening of the scene with twelve measures of an open-fifth drone in the lower strings, punctuated by a solo oboe repeating a single note two octaves higher, producing a sense of stasis from which the storm later emerges. 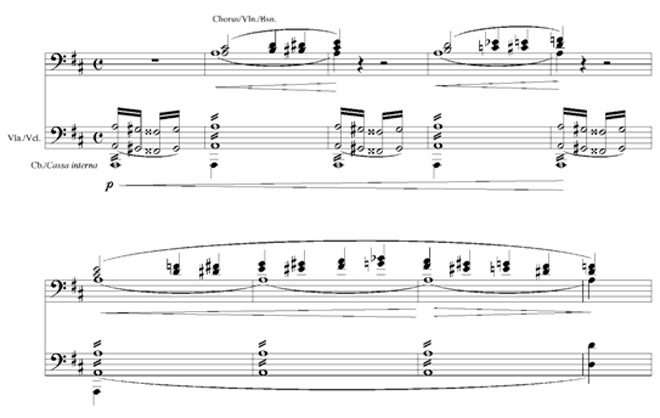 The following recitative secco, in which Rigoletto finalizes plans for the murder of the Duke with Sparafucile, is limited to the notes of the tonic triad, D major. Verdi includes a score direction forbidding the singers from ornamenting or embellishing the written notes in any way [“questo Recitativo dovrà essere detto senza le solite appoggiatura”]. For twelve measures the oboe and cellos sustain their open fifth (A–D) while jester and cutthroat confirm their sinister business. Upon Rigoletto’s departure the drone ceases and is taken over by faintly stirring [“appena sensibile”] tremolo violins. This gesture (motive a) serves to break the stasis of the previous section, heightening one’s sense of expectation. At the same time, Verdi indicates the significance of this musical gesture with a stage direction for the sky to darken and thunder to sound in the background [“il cielo si oscura e tuona”]. Immediately afterward a flute wisps downward and a piccolo shoots up an arpeggiated D-major triad (motive b) accompanied by a score direction indicating a lightning flash [“entro la scena si vedrà un lampo”]. As Sparafucile observes, “La tempesta è vicina!” [“The storm is near!”] Following Sparafucile’s observation, a solo clarinet plays the Duke’s theme from “Bella figlia dell’amore” to draw the audience’s attention to the interior of the building and the Duke’s attempts to break Maddalena’s resistance to his charms. Again, an indication of the approaching storm can be detected, first with motives a and b, followed by a bass drum behind the scene accompanied by tremolo low strings to represent thunder [“s’ode il tuono”] (motive c), then the male chorus vocalizando a bocca chiusa (motive d). The musical substance of motive d, like the other motives, is relatively slight: three male voice parts in strict part writing. The bass remains stationary upon one note while the other two parts rise chromatically in parallel minor thirds up to their highest point, a minor seventh above the bass, and then return to their initial position. Verdi continues to employ these devices while the dialogue carries on between the Duke, Maddalena, and Sparafucile, first the open-fifth drone of the opening, and the motives c and d. Unlike the first entrance of the chorus, which served to introduce the idea as part of a succession of “storm” motives, here it accompanies the words “Son venti scudi d’oro!” [“It’s twenty golden scudi!”] sung by Sparafucile piano to Maddalena. The reference to their monetary gain soon to occur through murder imbues the chorus with sinister significance. At the end of the section Sparafucile shows the Duke to his room and the clarinet once again intones the “Bella figlia” melody. Not only does the entire opening scene remain in D major, but also it never leaves the tonic. Indeed, the opening recitative between Rigoletto and Sparafucile stays entirely on the notes of the tonic triad, thus providing an additional reason for Verdi’s admonition against ornamentation. This skeleton provides a bleak blank canvas from which the chorus stands out with its chromatic inflections and allows for the growth and development of dramatic tension throughout the scene. After a break in the music, the open-fifth drone sounds once again for twelve measures, this time a fifth lower in G. Once again the entry of the chorus projects a sinister quality through the implication of Maddalena’s accompanying words “Dio! Qual notte è questa!” [“God, what a night this is!”], insinuating that the storm is both physically disturbing and a harbinger of the events to come. In unaccompanied recitative the Duke bids good night, followed by a comment of Sparafucile entirely on the note B. This B, the third of G major, becomes the tonic note of the following section. Motives a and b reappear to remind the listener that the storm has not abated. The Duke, now upstairs in Sparafucile’s room, sings “La donna è mobile,” but drifts into sleep, the clarinet carrying on with the melody when his voice fails. In the middle of the word “pensier” [“thought”] he stops singing entirely. The full text of “La donna è mobile” refers to women being as fickle as a feather in the breeze, changeable in word and in thought. This sentiment ironically underlines Maddalena’s changing opinion throughout the rest of the scene prior to the trio. It will be this same aria from earlier in the act that will appear again for a third time as Rigoletto realizes his cruel fate. Sparafucile and Maddalena discuss their plans for the Duke in a short recitative containing the first sense of localized harmonic motion within the scene. Verdi uses this motion to underscore the moving emotions of Maddalena as she begins to decide against killing the Duke due to her feelings toward him. The open-fifth drone follows, in B major, to provide harmonic closure to the previous section and also to act as an opening to the changing events that follow. Gilda appears outside in the road dressed in man’s attire, boots and spurs, and walks slowly toward the inn. Her appearance is accompanied by motives a, b, c, and d, followed by her response “Qual notte d’orrore! Gran Dio che accadrà?” [“What a horrible night! Great God, what is going to happen?”], echoing Maddalena’s earlier comment. The open-fifth drone appears for another twelve measures, this time in the key of E, a fifth below the previous section. Again, as in Section II, Maddalena accompanies the drone with a comment on the Duke’s physical attractiveness, this time likening him to the god Apollo, followed by a declaration of her love for him. As before, motives a, b, c, and d follow; then in recitative Maddalena tells Sparafucile that she has a plan to avoid murdering the Duke. Maddalena, accompanied by a resolute, rhythmical, march-like accompaniment in A major, a fifth below the previous section, suggests that they kill Rigoletto instead of the Duke. Sparafucile responds negatively, stating that a client who pays him buys his loyalty. Maddalena pleads for the Duke, Gilda worries for her father’s safety, and Sparafucile begins to capitulate to Maddalena’s suggestion as motives c and an abbreviated version of d alternate three times, with the last entrance of motive d significantly extended. Here motive d appears in the chorus doubled at the unison by the bassoons and tremolo violins, with the upper voices climbing to form a dominant ninth harmony before descending. This acts as an extended dominant pedal to the following section in D minor. Verdi has contrived this scene to be tremendously exciting and theatrical, as the Trio pauses for a clock to strike the half-hour before midnight (when Rigoletto is due to arrive for his prize), and for Gilda to knock and knock again between peals of thunder. Maddalena asks Sparafucile if he heard knocking at the door, but the latter dismisses it as the sound of the wind before realizing that Gilda stands outside. The rain, in the form of motive e, starts to fall intermittently. The chorus adds an extended curve of moaning similar to that in the Trio Introduction, again rising to the harmony of a dominant ninth, doubled by violins and bassoons. The second verse of the Trio allows for a greater intensification of the dramatic tension, delaying the inevitable outcome of Monterone’s curse through a repetition of the previous material. At the climax of the Trio, Gilda, knowing now she is at the point of death and about to save her faithless but magnetic lover, knocks for the last time and is admitted. The harmony of the cadence begins the same way as in the earlier interruption, however here, instead of deceptively falling away from harmonic closure as before, it fulfills the implication of the G-sharp diminished harmony. Three repetitions of motive d from the chorus on the same harmony anticipate its final resolution. Gilda enters; Sparafucile closes the door behind her, and for a brief period the stage is totally dark. During this orchestral passage the storm worsens, with fortissimo strains of motive e, and then gradually abates. As the storm quiets, two extended versions of the choral motive d occur, separated by a statement of motive c, each time accompanied by a statement of motive e.
In Section I the “wind” motive of the chorus first appears as an equal member of the various storm elements (mm. 39–41). On its second appearance (mm. 48–50) the motive gains a sinister quality through association with Sparafucile’s accompanying text “Son venti scudi d’oro!” [“It’s twenty golden scudi!”], referring to the payment for his services. This sinister quality builds throughout the scene, as the “wind” motive becomes the most prominent of the storm elements, both through repetition and expansion, and through its placement within the developing dramatic action. The triumph of this scene is the use of referential external associations—the inclusion of the “Bella figlia” melody just prior to the Duke’s first appearance in the scene—and internal associations—the repetition of motives particular to this scene alone. All the motives, including the one with the chorus, gain meaning through their repetition. The whole drama, the whole opera builds to the realization of Monterone’s curse. From the moment in act 1 that the chorus responds in horror to his curse with its “Ah!” of astonishment, the drama leads to some unforeseen, inevitable tragic resolution. It is this same chorus that contributes to the tempesta, and to the resolution of the curse. The last words of the opera, those of Rigoletto, are “Ah! La maledizione!” [“Ah! The curse!”] The final reference to the curse, preceded by an “Ah!” of despair, mirrors the earlier choral “Ah!” in act 1, directly related to the curse itself. The harmonic orientation of the ending, Db, shows Monterone’s curse triumphing in the end. 1 David R. B. Kimbell, Verdi in the Age of Italian Romanticism (Cambridge: Cambridge University Press, 1981), 628. 2 Giuseppe Giacosa, “Verdi in villa (Note),” Gazzetta musicale di Milano 44 (1889): 774–75; reprinted in Encounters with Verdi, ed., intro. and annotated by Marcello Conati, trans. Richard Stokes (Ithaca, NY: Cornell University Press, 1984), 159–60. 3 See David Lawton, “Tonal Structure and Dramatic Action in ‘Rigoletto,’” Bollettino dell’istituto di studi Verdiani 3 (1982): 1559–81.